Clarke, who scored 112 in the first innings, ended the day within three runs of recording his second hundred of the contest, but was left a little frustrated at being unable to get back on strike during the final over of play. 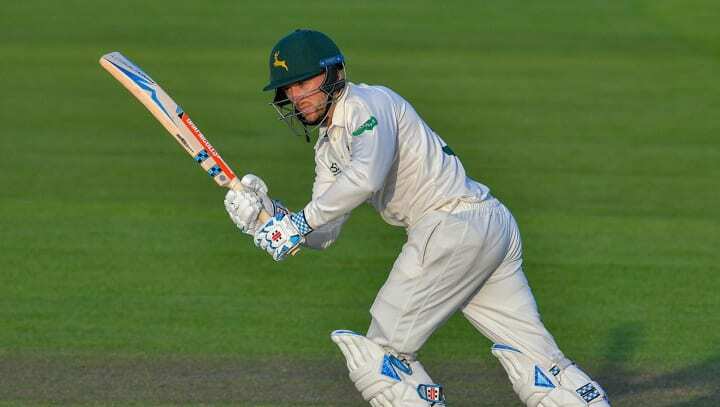 At 22 years and 316 days, the former Worcestershire player scored his runs from 125 balls with 14 fours, to come within touching distance of commemorating an historic landmark as the youngest to score two centuries in a match for Notts. Yorkshire’s first innings was brought to an abrupt closure during the morning, when they lost their last five wickets for 85, with Samit Patel, three for 31, taking three, including that of England Test captain, Joe Root, for 73. Duckett, who compiled a match aggregate of 298 against Cambridge MCCU last weekend, took his season tally of first-class runs beyond 400 before departing. Earlier, the visitors had begun the day on 206 for five, with Root unbeaten on 56. His overnight partner, Jonny Tattersall, drove Fletcher for an elegant straight drive to move to nine but was then comprehensively bowled next ball, attempting a repeat. Root charged towards the spinner and swished vigorously. He may have been stumped by a country mile had the sharp turn not brushed the outside edge on its way through to Steven Mullaney at first slip. Notts haven’t defeated Yorkshire at Trent Bridge in the County Championship since 2008 but are well poised for a tilt at ending that barren run with one day left.